So any progress? I think you really need to see what tight, alder/dogwood terrain can do, to topple a sled, send it into a spiral, twisting under its weight. Every trip is different, every sled has a difference. But what do You expect?. A slide over hard packed trail and a struggle through very boreal, thick under brush, following a bearing...are two different beasts. I recently struggled with an over-packed sled because it might have rained, might have been too cold, might have been a solar sunny day...all in a weekend. What a time we have with weather being so tepid. A sled replaces a back-pack. It allows more, but yes, weight matters. I say haul it all, then haul it again. The weight is not always a check list, it's a matter of circumstance. Some years we get lucky, others we lose. Also, my first choice of "harness" was a thin, sturdy webbing about two snowshoe lengths, or just enough that my heals didn't touch the front of the sled. I always said I would change it, I saw others with PVC or bars/poles to give sideways strength...but I never did. I still think a flexible, webbing pull is best. At night, I can sit on the sled and there are no trip hazards. 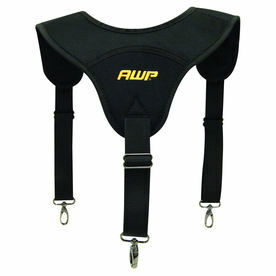 There are a few belts and over shoulder harnesses such as those used for construction tool bags. These are the cheapest I have found. I made a set DIY set up, but, changed over to the store bought ones. About $40 complete. I've been learning lots from this forum over the last year or two, but this is my first time posting. I've been outfitting a couple of sleds for an upcoming trip and have had to figure out a harness for both. I wasn't having much luck finding anything that quite fit the bill, but then I remembered my old treeplanting bags hanging in the garage. The harness is very durable and can be detached from the bags by undoing some hardware. The shoulder straps are also removable if you'd rather not have them. You can purchase the straps separately for $65.99. For my second set-up, I purchased a Kuny's padded tool belt (without pouches) from Canadian Tire. I think the treeplanting harness is a better option, but I don't want to spend $65 on a secondary harness and this option seems quite durable as well.